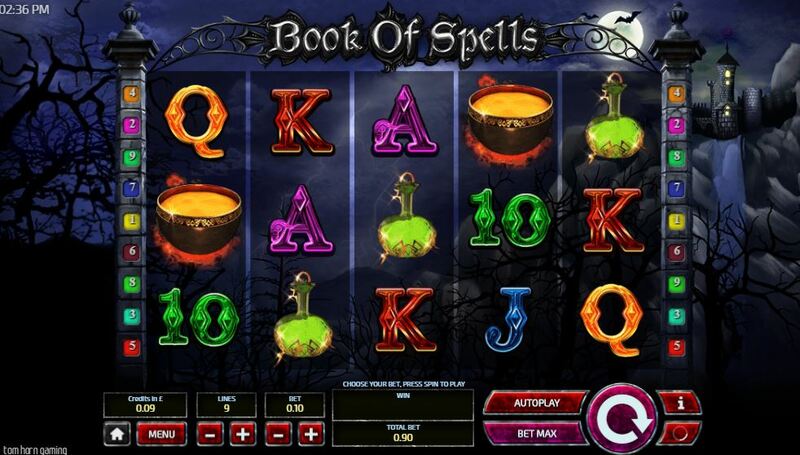 Immerse yourself in the spooky work of this Book of Spells slot online, where witches roam the reels and if you play your cards right, they might just cast a spell and make you rich. This casino slot features 5 reels and 9 pay lines so grab your broomstick and get ready to go. This game oozes an eerie vibe, with a dark night sky filling the background, which is lit up with the sinister glow of the moonlight and bats fly through the sky. There is a dark and mysterious looking castle behind black, iron gates and thorny trees, and one cannot help but think of a typical scary Halloween setting. The reels are full of Halloween symbols like a witch, witches hat, cauldron, spell book and a dangerous looking green potion. If you dare enter the dark castle you could unearth some treasures or end up running scared. To find out which it will be, pop to Easy Slots and get playing. Tom Horn is a worldwide iGaming developer that have been increasing their influence and expanding very quickly over the years. They have signed some impressive deals and created some even more impressive slot games. They have offices in Slovakia, Costa Rica, Gilbralter and the Czech Republic and rumour has it they are ready to expand their global reach even further. Some of their amazing slot online games have received much acclaim, that you should check out if you loved to play Book of Spells slot are Thrones of Persia, Gladiator Glory and Monster Madness. The first thing to be aware of for this Book of Spells casino slot game is the wild symbol which is represented but the book of spells symbol. 3 of these books scattered on the reels will multiply the total bet and trigger the Free Spins Feature. Now who doesn’t love a good round of free spins?! When this feature is triggered by the wild books, 10 free spins are awarded initially as well as a special expanding symbol. 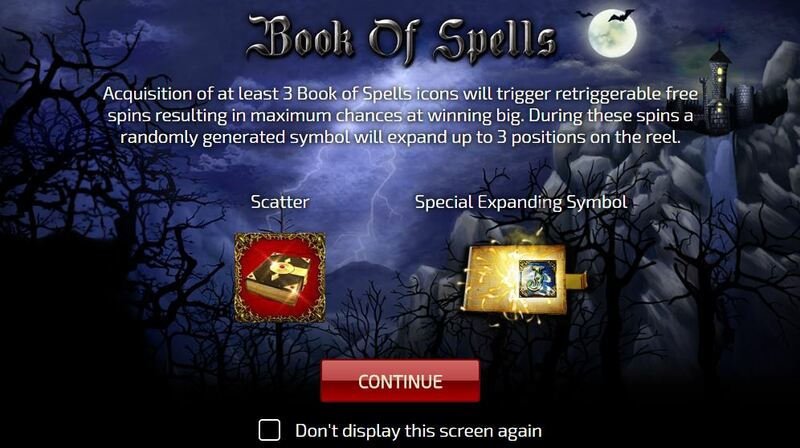 The special symbol is randomly selected by the spell book at the start of the free spins feature. During free spins, this symbol will expand to cover all three positons on the reels and even in non-adjacent positons. Good news indeed! This feature can be retriggered and the same special expanding symbol will be used again. Look out for the witch as she is a very lucrative symbol with 5 symbols paying 5000x as well as the cauldron symbol which pays out 2000x.